Discussion in 'Digital Darkroom' started by bgelfand, Sep 9, 2018. I have not tried this yet, but it should work for every day use. If you have a critical need, perhaps a commercial standard is required. Porta Brace video bags come with a 6x9" sheet of high density polyethylene (HDPE), possibly with titanium dioxide pigment. It is matte on one side and shiny on the other. It is an excellent target for setting white balance, while being very durable and easily cleaned. TFE is probably good too, but a strip 3/4" wide isn't very practical. It won't stick to anything, so wrapping it around a piece of cardboard, for example, is not very effective. You can get PTFE in sheets, but it's very soft, expensive and hard to find. What a lunatic suggestion! PTFE tape is only about 1cm wide, and not particularly cheap. You'd need a macro lens to get a reasonable area of it in the frame, unless you plaster it across a support surface. Except then it's slightly transparent and would show the background material through. Plus, it's PTFE and therefore non-stick! And anyone who's used the stuff knows how tricky it is to get it to stay put and lay flat. It's meant to be wrapped around a thread or a pipe, not stuck to a board. There's also the complication that cheap non-PTFE tape is also on sale as plumber's tape. Just use a sheet of copier paper doubled up. It's readily available, cheap enough to be disposable, large enough to fill the frame and white enough that anything else is going to look cream or yellow by comparison. Someone is going to mention optical brighteners. Well duh! That's what makes copier paper so white and reflective. Photography isn't that scientific. We don't need a near-perfect lambertian 'white' substance as a reference surface. Although copier paper comes darned close. "Sintered PTFE has been known to have high spectral purity, low opacity..."
- Except plumber's tape isn't sintered. It has a shiny finish that's not even close to lambertian. Brighteners work by fluorescing blue, to offset the natural yellow color of wood pulp. That may bias the results where there is a lot of ultraviolet light, including daylight, fluorescent lights, studio flash and LED replacement bulbs. Coated paper is not as "white" as copy paper, but the reflectivity is more uniform. If you want consistency, pay the man and get a certified standard, e.g., from X-Rite (nee, Gretag MacBeth). In Lightroom I simply select what I know is a neutral white/grey color in the scene, works well enough. Often this is the ceiling, radiators, or light switches. In the below example I got a perfectly even RGB reading by selecting the bottom part of the door. Rodeo_Joe, I do not know where in the world you live, but here near Sacramento, California PTFE plumbers tape is $0.97 at Home Depot for a roll 1/2 inch wide by 260 inches long. I hardly consider that "expensive" especially for a photographer considering the cost of our gear. Heck, you spend more for a few sheets of lens tissue or two AA batteries. As for the size, the color squares on my X-rite Color Checker are approximately 1/2 inch by 1/2 inch. I have no problem getting a reasonable reading off the Color Checker without using a macro lens (in fact I do not own a macro lens, yet). Had you read the article, you would have noted the author recommended wrapping several turn of tape around an eraser which makes an even larger target. As I wrote, I have not tried this yet, but I look forward to doing so. Put your 'white' reference in shadow on a sunlit day and it's no longer 'white'. Put it near to, and reflecting a brightly coloured object, and it's no longer 'white'. Light it with fill flash in daylight, and it's no longer 'white'. It can be made of sintered PTFE, compacted magnesium sulphate, a bit of X-rite plastic-laminated card or a roll of plumber's TPFE tape. It still won't be 'white' in those circumstances. Scientific perfection doesn't count for much in everyday photography, where near enough is almost always good enough. We work with light units that double or halve with each step, for goodness sake! How the heck can you set a custom white balance in-camera from a 1" square bit of plastic tape? And who wants a 'white' blob of anything stuck in the corner of every shot? With lens vignetting preventing it from even being the brightest object in the frame too! How the heck can you set a custom white balance in-camera from a 1" square bit of plastic tape? The whole point of it isn't to set a correct white balance in camera but to use it as a reference point in post-processing. Normally when using a grey card you would take a picture of the scene that includes the grey card, then you'd take another picture of the scene without the grey card. In postprocessing, you use the picture that includes the grey card as the reference point for white balance (by selecting the grey card) and then copy those settings to the picture without the grey card resulting in an image with the correct white balance. If you shoot a lot of interiors like I do that don't require absolute 100% fidelity such a process is kind of a hassle. So that's why I simply use areas in the scene that I know are within the ballpark of a neutral white/grey in order to get to a neutral white balance during post-processing. The example I posted by selecting the door as the reference white balance point resulted in a 100% even R G B reading which is what you'd aim for when correcting the white balance, to get all R G B percentages as close to each other as possible. I seldom get such an even reading on first selection though and mostly adjust the white balance on feeling and knowledge of what the scene (like ceilings or radiators) is supposed to look like. To get the R G B readings of the white balance in whatever parts of the scene press the W key in Lightroom. White Melina coffee filter. Perfect spectral flatness! But then I'm with Rodeo Joe when shooting outdoors in changing light and WB. I just set the camera to AWB shooting Raw and forget about it. I mean what white balance target are you going to use shooting a sunset? You aren't going to get what you want going that route. More work in post than you'ld ever want to deal with. "Normally when using a grey card you would take a picture of the scene that includes the grey card, then you'd take another picture of the scene without the grey card." - Well, normally I wouldn't. When colour accuracy is critical, I take a custom white-balance in camera and then not have to waste time in post poking about the scene with the colour picker tool. Grey cards can get dirty or faded, and by the very nature of the Bayer RGB colour analysis (or approximation) that takes place in a digital camera, it's almost impossible to get totally faithful colour reproduction across a range of real-world dyes or pigments. The result is that if one particular colour is accurately eye-matched, then another is thrown out, needing tedious hue-shifting to get an overall close approximation to the original scene. Luckily, for most jobs, getting absolute colour accuracy isn't a requirement (or even a possibility) and as I said, close enough is good enough. Setting a custom white balance in camera takes too much time when moving around from one area/room to another. Doing it in post-process means less time in such cases. I have these in my bag. They’re plastic and can be easily wiped clean. Haven’t used them yet though. Since it hasn't been mentioned there's also the issue of the camera profile both custom and canned that can do some really strange color twists that adjusting WB in the Raw converter can make better or worse. 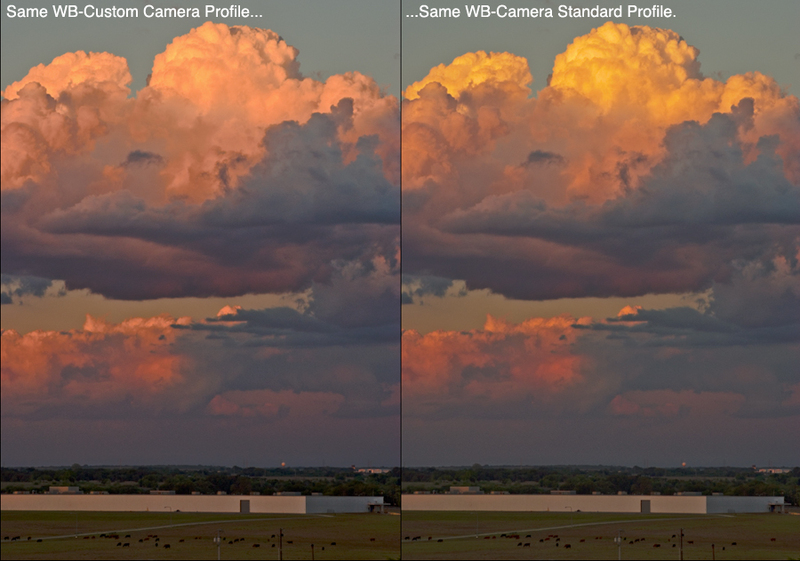 Sometimes not changing the WB and only the profile will make the image better but not accurate like the convection cloud example below. I prefer the golden yellow highlights of the one on the right, a color that one would normally attribute to WB. .DCP profiles have absolutely nothing to do with setting white balance. They are WB agnostic BY DESIGN. Post the plots please. AS illustrated in Iliah's article with the tape which works very well indeed. Gray balance isn't the same as white balance. Gray balance on gamma encoded imagery, white balance on linear encoded (raw image data). HALF of all the data in a raw file is encoded in the first stop of white and hence, this is why we WB raw data. It isn't called gray balance because that's not taking place on raw data. You can use gray, it's far from ideal when balancing raw data. If I shot RAW a lot, or used a card, I'd need to figure it out. I use the camera(s) WB settings and adjust minimally in post as may be needed for things to "look right" to me. For me the point of technical overload which removes a great deal of the Joy of photography comes early on on the process. Posted the link as simply additional info. If I were working professionally instead of for my own enjoyment I'd have to grit my teeth grind through all of the details. For me the point of technical overload which removes a great deal of the Joy of photography comes early on on the process. Be prepared to have the joy sucked out of this thread topic with any technical input by Andrew Rodney/Digital Dog. He doesn't know how to read the room and will argue over the most inane technical points in an attempt to belittle anyone with a difference of opinion or first hand observations in the field that goes against his expertise. I have him on ignore over at LuLa. And it looks like I'm going to have to put him on ignore over here as well. All I have say over is what I enjoy and the ways I pursue that pleasure. Many are far more knowledgeable. Just so long as we treat each other with reasonable courtesy, we can agree to disagree!